A Brutalist complex meant to represent progressive government through ambitious design is no longer. 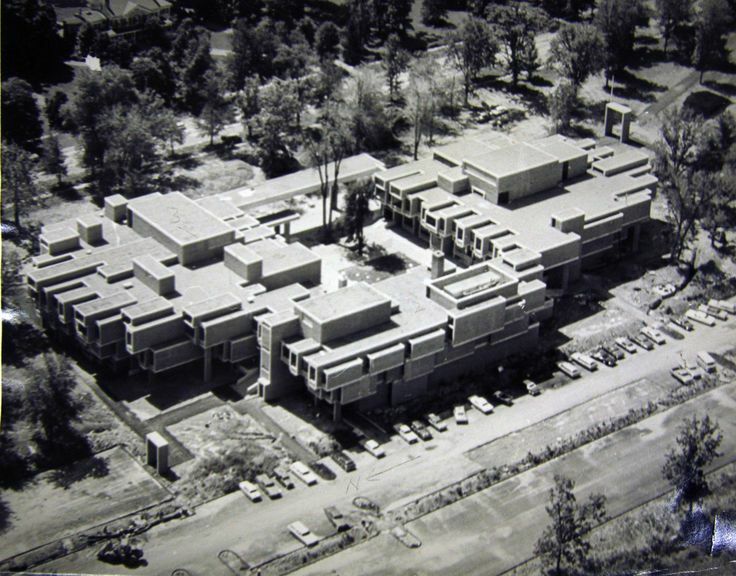 What happened to Paul Rudolph’s Orange County Government Center? After closing in 2011 in the wake of hurricane-related damage, Government Center will finally reopen this October, fresh from a $74 million restoration effort that architects, preservationists, and local lawmakers had battled over for several years. Now that the project nears completion, it’s already clear that the polarizing results may end up pleasing none of the various sides involved in the debate. How did such an important American building get such a bad makeover? The answer boils down to local politics, clashing design visions, and a sobering reality: There’s something sadly diminished in the kind of architecture American government chooses for itself today. In the mid-1960s, Rudolph sat comfortably at the top of any list of best practicing American architects. He’d built his reputation on stunning Modernist homes in Florida but had shifted the focus of his practice to the public realm, creating a series of highly visible Brutalist complexes in the Northeast. In Goshen, he brought a little bit of both with him, using uniquely arranged windows that resembled his Milam Residence in Jacksonville, and bushammered concrete blocks as seen in so many of his academic and government buildings. Government Center was supposed to be one-stop-shop for the county’s public services, and Rudolph conceived it as a dynamic space. Architect Sean Khorsandi, a Paul Rudolph Foundation board member, told CityLab in 2015 that Rudolph wanted the project to be “a symbol of a different regime.” The building’s bold, angular forms signaled the start of a brash, progressive chapter for local government to the judges, legislators, and citizens who stepped inside. The final design was approved by the Orange County Board of Supervisors in 1966. Tim Rohan, author of The Architecture of Paul Rudolph, notes that the timing of design—amid the social upheavals and civil rights progress of the mid-1960s—informed the architect’s vision. “This project moved courts into the modern age and conveyed an appropriate dynamism, when they were becoming concerned with social justice issues,” he says. But soon after work was completed, problems emerged. The architect’s public sector prospects dried up in the early ‘70s, as government budgets dissolved and the postwar enthusiasm for modernism began to fade. The flaws in the final product certainly didn’t help. Workers complained that there wasn’t enough space. Visitors complained that it was too hard to find where they needed to go. And the buildings leaked, though less dramatically than Rudolph’s Niagara Falls Library fiasco. Rudolph was asked by the county legislature in 1975 to contribute to a settlement payout in response to a lawsuit filed by the general contractor on the project. In 1977, his final year in office, Mills issued a memorandum to the legislature’s Finance Committee expressing concern over the complex’s appearance and lack of maintenance funds. Government Center’s decline only continued. Those same courtrooms that were supposed to usher in a new era of progressive justice were declared unfit for use by the state Court Facilities Capital Review Board in 1997, the same year Rudolph died. A traditionalist-style courthouse opened next to the complex in 2000, with other offices moving into the space left behind. In 2002, new county executive Ed Diana, a Republican, first announced his interest in completely replacing the facility. Legislature Democrats pushed back, and while Diana conceded at the time, it was clear he wanted the building gone. In 2010, Diana dropped his plan to build a $114 million Government Center, and would instead explore options for replacing some or all of the complex. The Paul Rudolph Foundation asked the New York State Historic Preservation Office (SHPO) shortly after if the buildings would be eligible for listing on the State and National Registers of Historic Places. SHPO informed Diana that it would. Diana asked again for a total demolition and replacement of the complex. In 2012, thanks in part to a backlash from preservationists—including a petition of over 2,000 signatures from around the world, according to World Monuments Fund—the plan failed to get a two-thirds majority vote from the county legislature. Shortly after, The Times Herald-Record published a post-Irene analysis of the building from FEMA which Diana did not share with the legislature before voting on the Government Center’s fate. It disputed the county executive’s claim that the complex was unusable as a result of the storm. Instead, it concluded that a majority of its damages were the result of questionable construction quality, poor design detailing, years of deferred maintenance, and a poorly done renovation in 2009. County consultants had estimated $10.5 million in damages from Irene. FEMA, after first offering $500,000 in aid for Government Center, eventually awarded the county $3.6 million. In the middle of all of this arrived designLAB, a Boston-based firm that was already working on another Rudolph renovation. “We were in the construction phase at UMass Dartmouth, completely renovating the main campus library’s building systems,” says Robert Miklos, founder of designLAB. “We learned about the controversy in Goshen and wrote an open letter to the legislature letting them know that we were economically renovating a building from the same era and architect. A group of them came from Goshen to Dartmouth and toured the building.” They left impressed. Miklos and designLAB joined Clark Patterson Lee on the project and was first asked to put together a new building assessment study, followed by a reuse study for all three buildings. Some political maneuvering intervened, however. “The majority of Republicans wanted it torn down, and the Democrats were for saving it,” Miklos says. Eventually, a compromise was reached: The most problematic of the three buildings would be looked at for replacement while working through a budget for a full renovation within the county’s target figure of $60 million. Diana was on board with the legislature-approved plan by December 2013, his final month as county executive. But project estimates increased to $85 million in early 2014; designLAB quietly resigned from the project after the state’s review for historic buildings was ignored in the design process. Clark Patterson Lee’s design called for demolishing and replacing one of Rudolph’s buildings entirely and stripping the corrugated concrete block facades of the other two; it was criticized by SHPO. Even though Orange County never registered the complex for historic designation, the project couldn’t receive FEMA money for the project without adhering to state preservation guidelines. The village of Goshen, settled in 1714, will never be confused for a bastion of brash design. Charming homes and small-scale civic buildings—including Goshen Town Hall, a former school Noah Webster taught at in the 1780s—dot a quiet road leading up to the southern side of Government Center. Stately properties with vast lawns face the east side of the complex along Main Street. 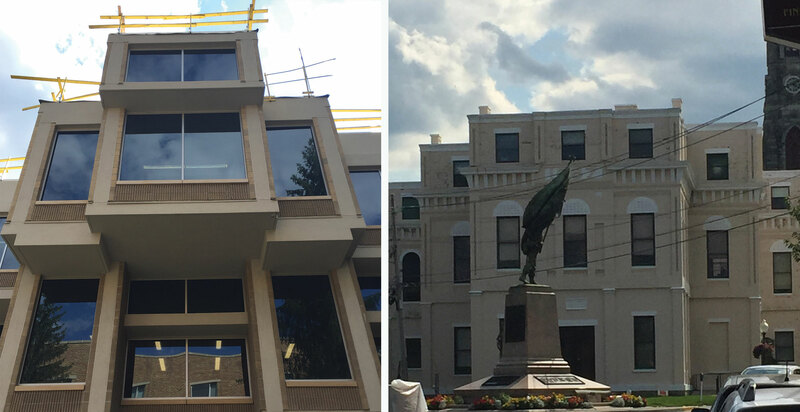 While not obvious and perhaps even unintentional, the ends of those jutting rectangular forms on the north and south ends of his work resemble the Main Street vista of the old Orange County Clerk’s building nearby. The current county executive Steven Neuhaus, a Republican, disagrees: He tells CityLab that it “was not keeping with” the town’s traditional architecture. Work on Clark Patterson Lee’s cladded and glass-enveloped addition is now wrapping up on the site. Same for the remaining two original buildings, which have been stripped down to their bones and re-dressed as duller versions of themselves. While giving a construction tour of the new building to the press earlier this year, Neuhaus touted the project for the fact that it was happening at all. Government services, spread around town since the fall of 2011, will be back under one roof again. “Just for the public to see that progress is being made and we're heading in the right direction would be, I think, a positive message,” he said at the time. And that appears to be as much as you’re allowed to ask of government, which continues to shrink in size and shrivel in stature across much of the U.S., long since Rudolph ran out of public works to build. What exists now in Goshen is a civic building that says, “At least it’s something.” What it replaces thought so much more of itself, and everyone who entered.